Nagasaki Japanese Language School was founded in May 2011, providing long-term Japanese language courses in Nagasaki, Japan. It cooperates with “Nagasaki Universal University”, which is nearby and is a sister school. There are various levels offered, from beginner’s class to the upper grade. Teachers do instruction in accordance with the level of the students. The aim of this course is to enroll into a school of higher education: university, technical school … It includes preparing for “Japanese Language Proficiency Test”, “Examination for Japanese University Admission for International Students”. Students learn Japanese with a good balance of “reading”, “writing”, “listening” and “speaking”. Able to read and understand passages on familiar daily topics written in basic vocabulary and kanji. Able to listen and comprehend conversations encountered in daily life and generally follow their contents, provided that they are spoken slowly. Able to read materials written clearly on a variety of topics, such as articles and commentaries in newspapers and magazines as well as simple critiques, and comprehend their contents. Able to comprehend orally presented materials such as coherent conversations and news reports, spoken at nearly natural speed in everyday situations as well as in a variety of settings, and is able to follow their ideas and comprehend their contents. One is also able to understand the relationships among the people involved and the essential points of the presented materials. Able to comprehend orally presented materials such as coherent conversations, news reports, and lectures, spoken at natural speed in a broad variety of settings, and is able to follow their ideas and comprehend their contents comprehensively. One is also able to understand the details of the presented materials such as the relationships among the people involved, the logical structures, and the essential points. We support the students who wish to enter to universities in Japan and help them to prepare for admission exam. 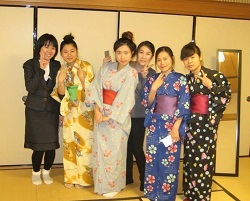 There are a lot of school events like speech contests, “School trips”, “Experience of Japanese culture” … many ways to learn Japanese and have fun at the same time. Combining lessons and out-of-campus activities is important to comprehend Japanese language and culture alike. The school also provides career guidance and preparation for the next endeavors you will choose. Haenozaki MG residence offers single room and double room. Rooms are equipped with desk, chair, rocker, bed and bathroom. The facility available in the residence includes automatic vending machine, coin-operated laundry, elevator, sharing kitchen, bicycle-parking area, Athletic field and gym (fee applies). The tuition and fees of Nagasaki Japanese Language School are as follows. Here are the estimated costs for one academic year at Nagasaki Japanese Language School. 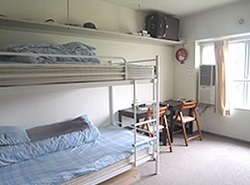 Costs are based on dormitory double room (25,000 yen/month). The estimated costs depend on how long you stay.